This past spring I was asked by a friend and colleague, Chris Martine, to be featured in an upcoming episode of Plants Are Cool, Too! A few months later, in August, we taped episode 4, focusing on my work with plants and pollinators, and episode 5, which will feature the work of Mike Moore of Oberlin College on gypsum-endemic plants (to be released later this year). So what exactly is Plants Are Cool, Too!? So what does it take to create an episode? And how about two episodes at once, in just three days? Certainly, lots of planning, people who know the lay of the land, and a fantastic film crew. Thankfully, Chris is really good at what he does—the team of people he pulled together couldn’t have been better. 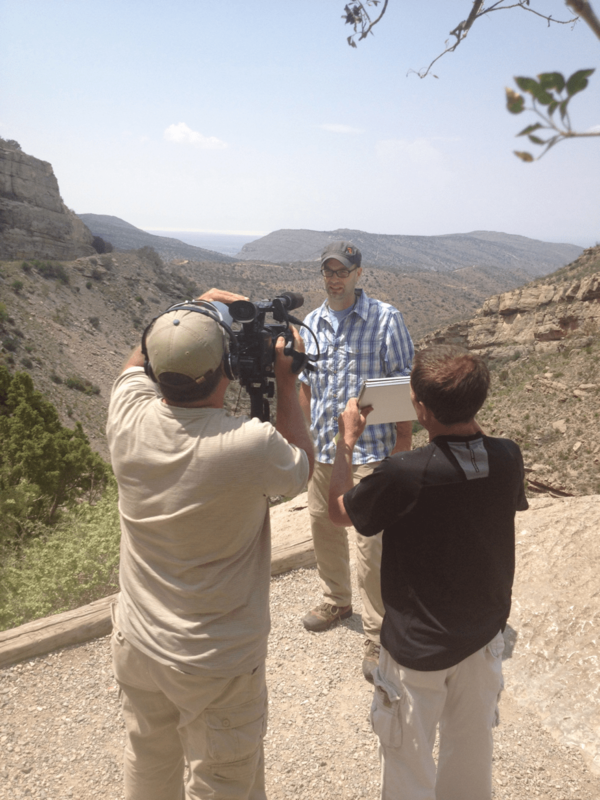 Our first site for filming was Yeso Hills, just southwest of Carlsbad, New Mexico. We arrived at the golden hour, when the sun is near the horizon and casts a golden light on everything. As we turned off the highway onto a gravel road, we encountered a sea of sundrops (Oenothera hartwegii and O. gayleana). I had a hard time containing my excitement. I’ve seen photos of populations like this, but nothing like it in person. There were plants everywhere, hundreds of them, their yellow flowers on full display, glowing magnificently in the setting sun. I suspected it would be a fantastic night for hawkmoths—how could they not be drawn to this fantastic population? So many plants, so much nectar! It was going to be awesome. 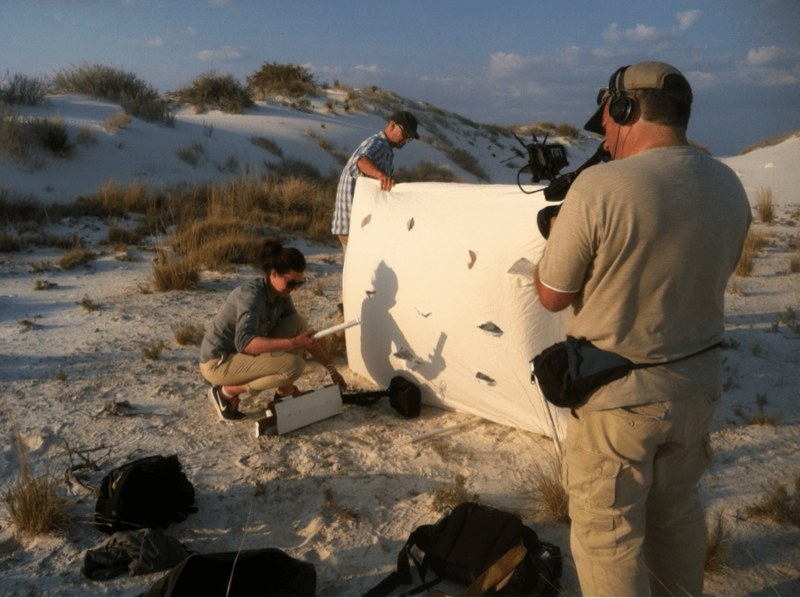 The sun set and we taped a handful of things: setting up the “moth sheet,” collecting floral scent, nectar, size measurements. And we waited and waited for the hawkmoths to show up; after about two and a half hours, we headed toward Carlsbad for the night. While I couldn’t imagine a better place for a hawkmoth to be, they clearly could. 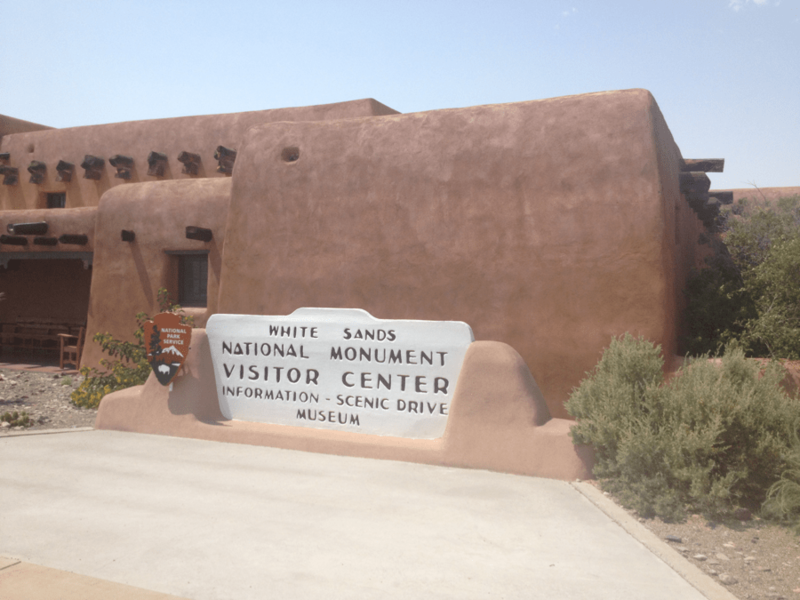 The following morning, we headed for White Sands National Monument, home of the world’s largest deposit of gypsum sand dune field, just west of Alamogordo, New Mexico. 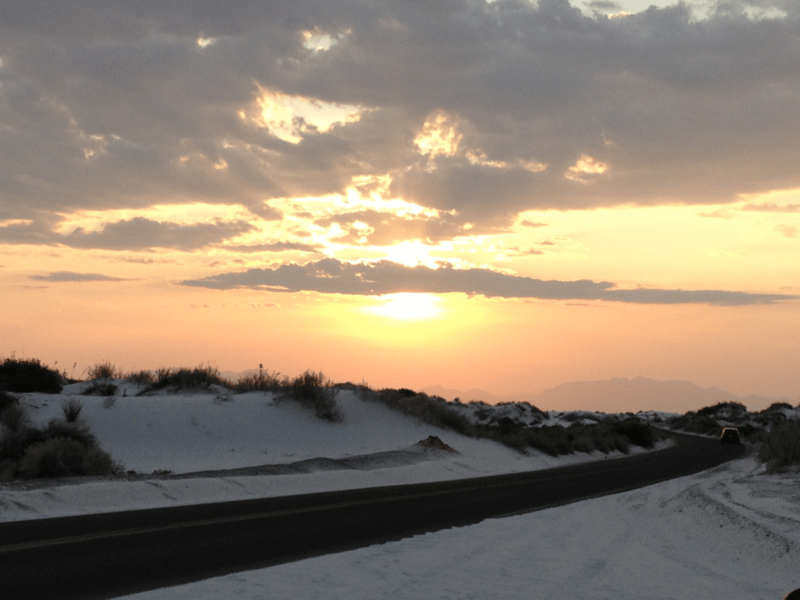 August 21 was a special night at White Sands—Full Moon Night. The park stays open until 11 p.m., and visitors come from near and far to experience the magic of the white sands by moonlight—which was one of the main reasons we were there. 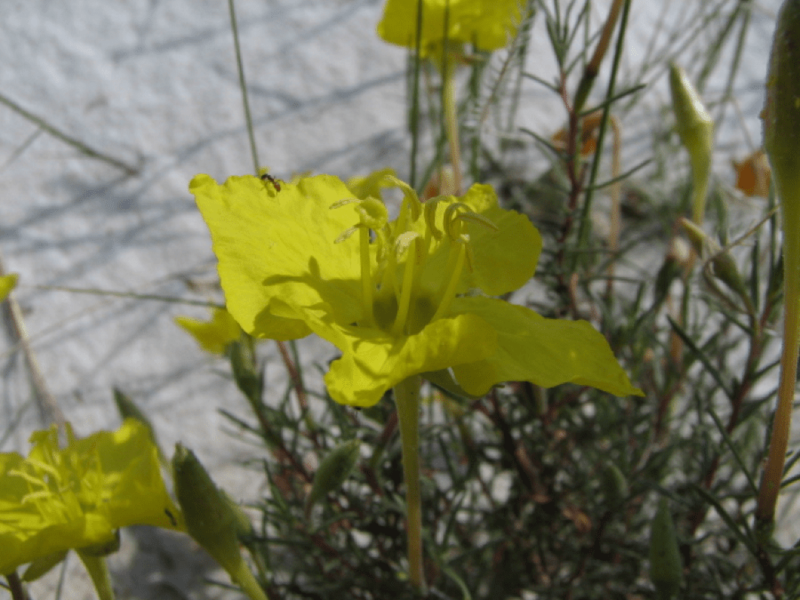 The flowers of the Hartweg’s sundrops glow in the moonlight and are very easy to see when the moon is full, by us as well as their hawkmoth pollinators. After checking in with the National Park Service office, we set out to find Hartweg’s sundrops. The dunes provided the perfect white backdrop to capture hawkmoths visiting the flowers. Usually it’s hard to follow an individual moth at dusk; they become lost in the vegetation unless they’re quite close to you. 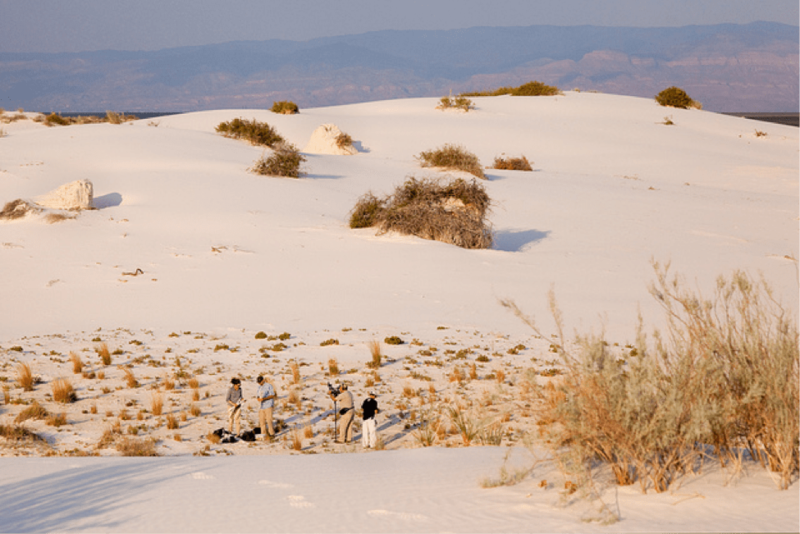 At White Sands, you could follow an individual hawkmoth easily, from flower to flower, plant to plant—that is, if they showed up. For a second night, we were out at the golden hour. Everything was beautiful, bathed in the light of the setting sun. We were feeling optimistic. Considering that this was our last chance to capture moths on film, we were prepared to stay as late as necessary. Looking around at everyone, I realized just how lucky I was, how lucky we all were to be there, together, at this incredible place, on what was sure to be an incredible night. Could we also be so lucky as to be graced by the presence of hawkmoths? We had come so far to capture this moment, and I have experienced many nights when conditions seemed ideal for hawkmoths to show up, only to be stood up instead—like the night before, at Yeso Hills. Before long, the sun had dropped over the horizon and the timing seemed right. I mentioned to Chris that I wouldn’t be surprised if we started to see some hawkmoths. As if on cue, a moth flew right by Chris’s head, close enough for him to hear its papery wings fluttering about—all as the camera was rolling! To say I was excited is an understatement. One moth turned into two…three…six…ten—visiting flowers, drinking nectar, and picking up pollen on their tongues, faces, and bodies, moving it from flower to flower—doing the ever-so-important job of pollination. You see, these plants will not produce fruits or seeds on their own—they require pollen from a different plant to do so, and that pollen has to be transported by a pollinator. So after much nervous anticipation, the hawkmoths had arrived. 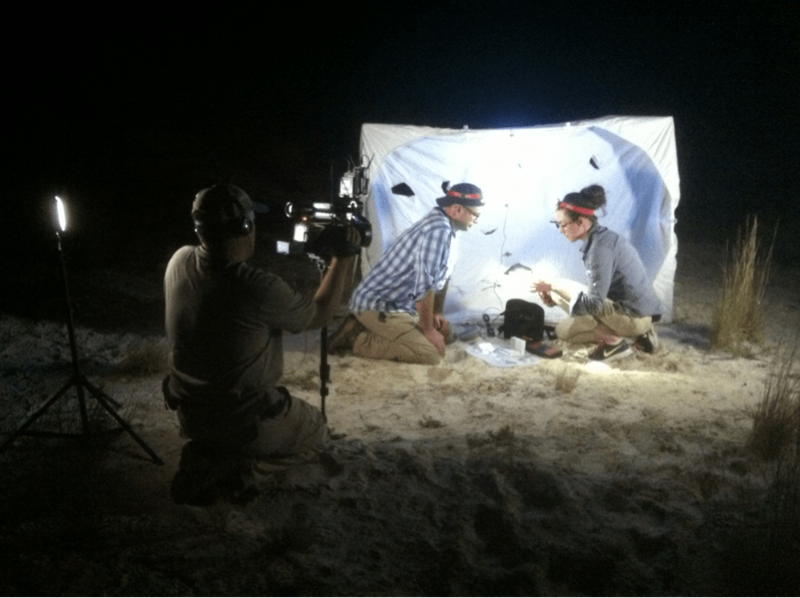 And now you can see the full episode and how our adventures fit together into a nice story about desert plants that flower at night and their hawkmoth pollinators! 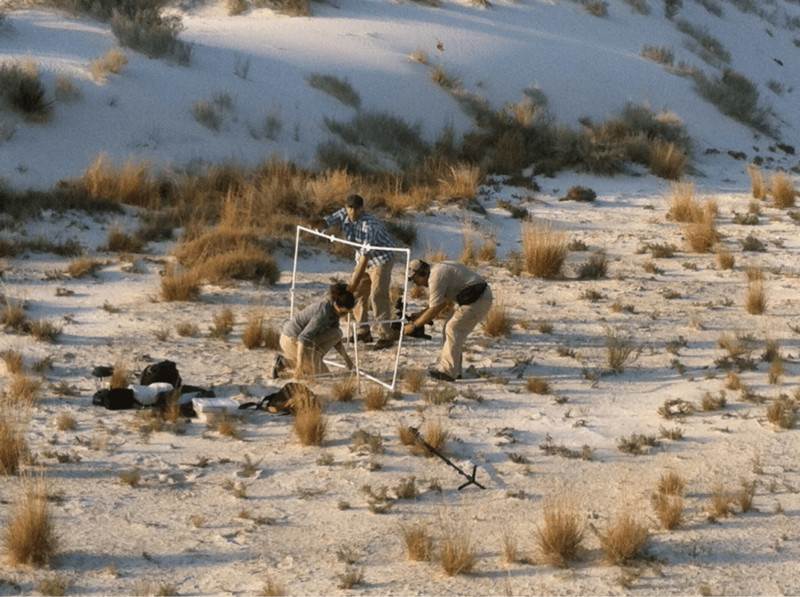 Many thanks to Chris, Tim, and Paul, for being so incredibly fantastic to work with, and Mike, Norm, Hilda, Helga and Patrick, from whom I learned a great deal about the New Mexico flora and gypsum endemism. Thank you to Sophia Siskel and the Chicago Botanic Garden for providing financial and institutional support. This trip was truly the experience of a lifetime. Summer romance is in the air on the shortgrass prairie of southeastern Colorado. Quite literally, the alluring fragrance of Harrington’s evening primrose (Oenothera harringtonii) wafts in the breeze when the plant blooms each evening. Insects from bees to moths follow the scent to the flower of their dreams. Dr. Skogen sets up floral-scent collection equipment for a previous experiment at the Garden. 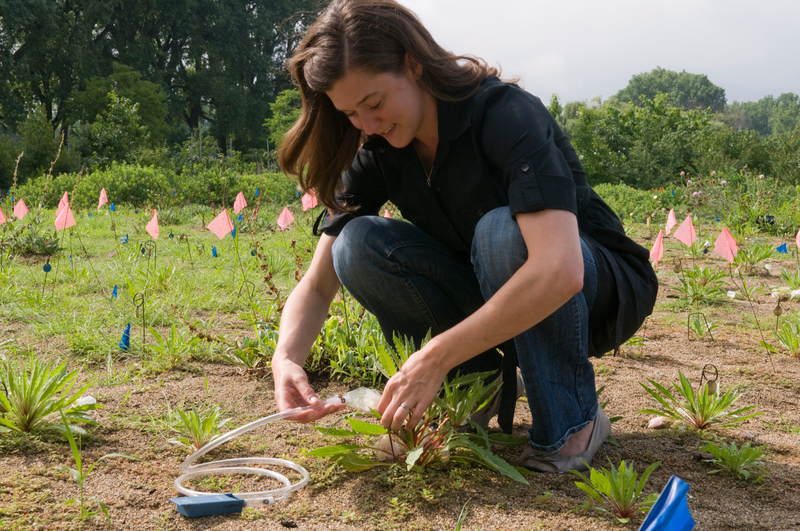 The insect’s choice of flower is significant to the future of the plant species, according to Krissa Skogen, Ph.D., Chicago Botanic Garden conservation scientist. After a pollinator lands on a plant and sips its nectar, it may carry a copy of a plant’s genes, in the form of pollen, to the next plant it visits. That next plant may then take those genes to combine with its own to form a seed—creating the next generation of Harrington’s evening primroses. How do pollinators select a flower? According to Dr. Skogen, floral scent heavily influences their choices in addition to floral color and size. “Floral scent is this fascinating black box of data that a lot of reproductive biologists haven’t yet collected,” she said. 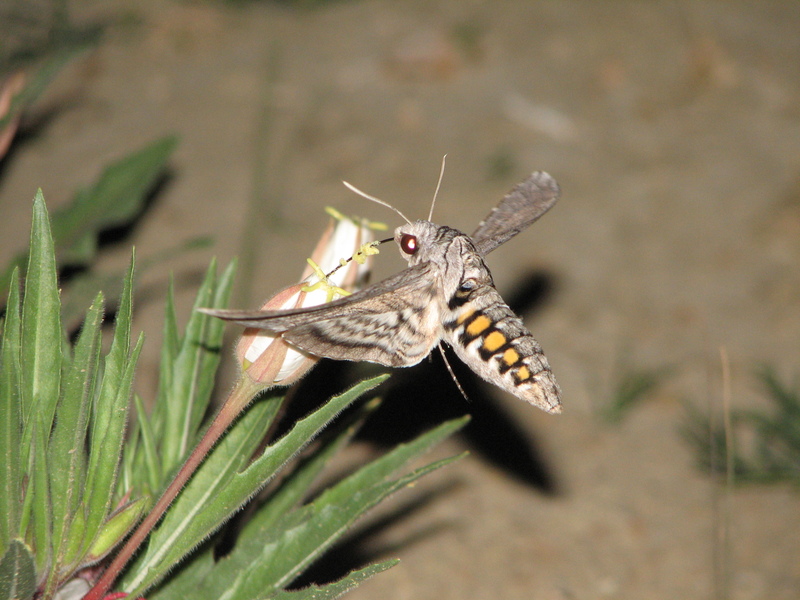 After studying the many pollinators of the evening primrose, from bees to moths, she found that two species of moths called hawkmoths—or more specifically, the white-lined sphinx moth (Hyles lineata) and the five-spotted hawkmoth (Manduca quinquemaculata)—are most effective. She told me that 30 percent more seeds are produced when a hawkmoth pollinates a plant rather than a bee. Dr. Skogen and her team start their evening pollinator observations at dusk in Comanche National Grasslands. “What’s really awesome about this system is that these hawkmoths can fly up to 20 miles in a night, while bees typically forage within one to five miles,” she added. 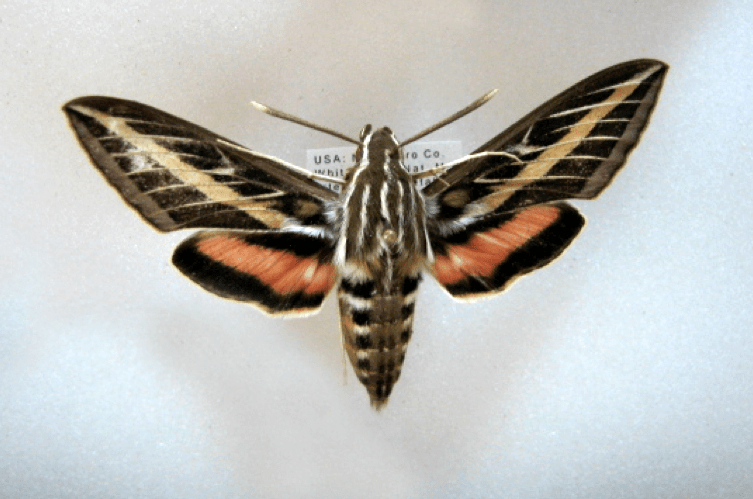 An insect so large it is often confused for a hummingbird, the brown-and-white hawk moths can carry genes between the widely spaced evening primrose populations. 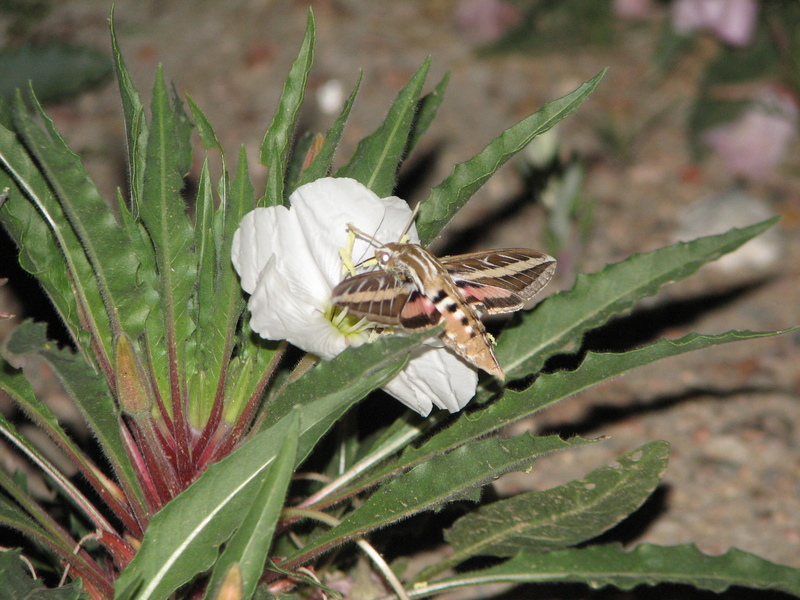 A five-spotted hawkmoth visits Harrington’s evening primrose near Pueblo, Colorado. In fact, Skogen has genetic data that support this idea—the roughly 25 populations she and her colleagues have studied throughout southeastern Colorado really act as two to three genetically, because the hawkmoths do such a great job moving pollen over long distances. Skogen and her colleagues have determined that flowers in some populations smell very different from each other, and these differences in fragrance can be detected by humans. Fragrance combinations include green apple, coconut, jasmine, and even Froot Loops™. Skogen’s theories suggest that differences in floral scent may direct female white-lined sphinx moths to the best host plants for their eggs, attract enemies (including seed-eating moths), reflect differences in soil, or the floral fragrance of other plant species flowering nearby. The white-lined sphinx moth drinks nectar from Harrington’s evening primrose in Colorado. What combinations of genes create the scents that best attract the hawkmoths? What do the genetic data of existing plants tell us about the direction genes have moved in the past? Are other insects, such as herbivores and seed predators, helping to move pollen or inhibiting reproduction? These are the questions Skogen and her research team, including the Garden’s Jeremie Fant, Ph.D., and students Wes Glisson and Matt Rhodes, will investigate further. Late this summer and in future fieldwork, they will monitor the pollinators and collect floral and plant-tissue samples. Back in the Harris Family Foundation Plant Genetics Laboratory and the Reproductive Biology Laboratory at the Garden, they will compare the genetic data of these plants with the observed patterns of the pollinators, and other floral data. Each trip is another step closer to having a positive impact on the future of the state-imperiled evening primrose and its choice pollinators. This species is endemic, growing only in southeastern Colorado and northern New Mexico where the unique soils best suit its needs. Learn more about Dr. Skogen’s work and watch a video. Because the species grows in limited locations and is easily thwarted by the impacts of development, climate change, invasive weed species, and other intensifying threats, it’s especially important that its future generations are strong. As dusk fell over Illinois State Beach Park, Jeremie Fant, Ph.D., perched silently beside the rare downy Indian paintbrush. He watched as the white-blooming Castilleja plant opened its tubular flower and emitted a sweet scent. The clock ticked past 6 p.m. Cautiously, a moth appeared out of the night sky, and fluttered over to sip the plant’s nectar. Bingo. 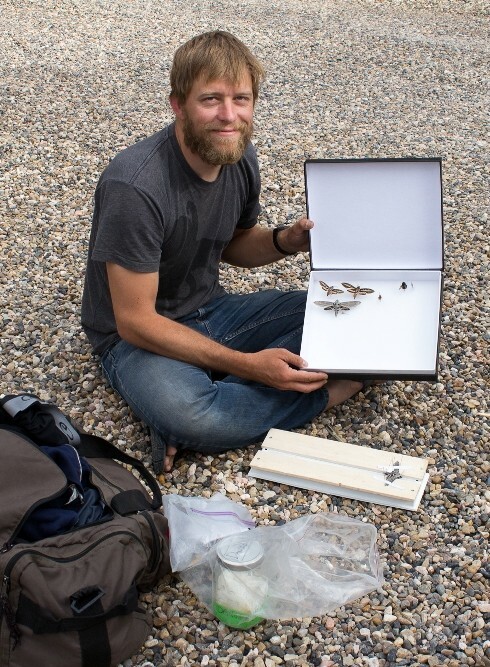 That moment, and subsequent research in Illinois and Colorado, led Dr. Fant, a molecular ecologist with the Chicago Botanic Garden, to become the first to document the moth as a pollinator of Castilleja with Krissa Skogen, Ph.D., his research partner and a conservation scientist at the Garden. 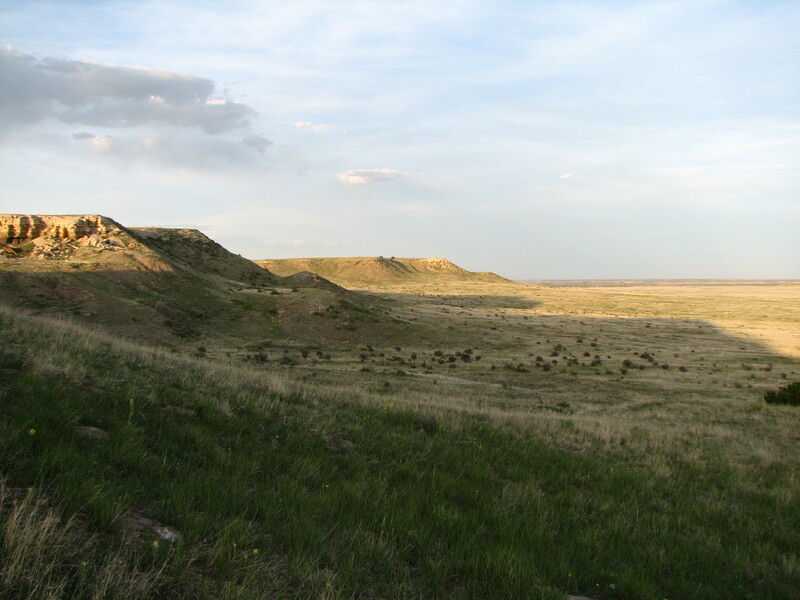 Dr. Fant conducts fieldwork in the Comanche National Grasslands in Colorado. 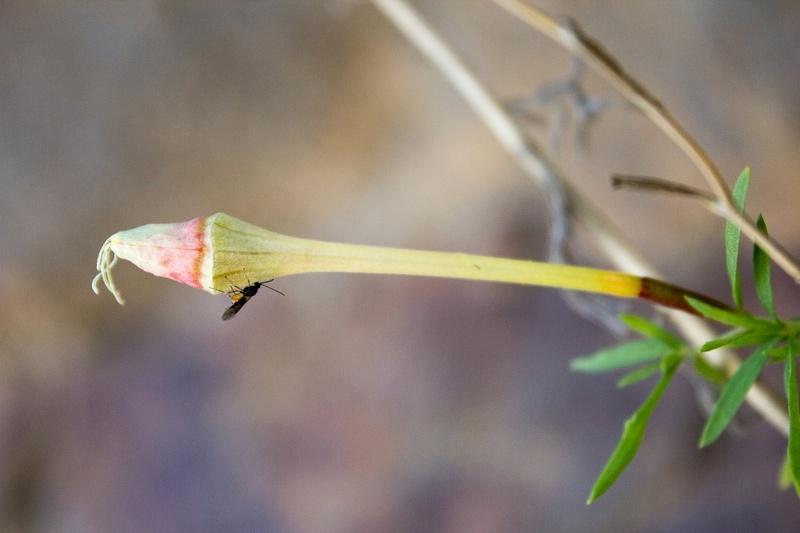 Fant studies the importance of how flowers are designed to attract specific pollinators, and what a plant’s pollinator means for its survival as a species. “I am fascinated by the way these events can lead to permanent impacts on a plant population,” he said. He recently explained the intricacies of the process to me, and why the palette of colors we see in the Garden and elsewhere is not only beautiful, but also functional. Pollinators—such as bees, birds, flies, and moths—offer specific benefits to plants, according to Fant. Birds travel expansive geographic areas, and can spread the pollen of a single plant over a large area. Bees, on the other hand, are more localized in their foraging, covering more plants in a condensed area. Where moths fall in this spectrum is not known: they may diversify the genes in a plant population by carrying pollen further than bees, but they may not travel as far as birds. “The imprint left behind from genealogy is stamped on the landscape, and it’s my job to figure out how that pattern got there,” said Dr. Fant. A flowering plant puts a lot of energy into producing a flower. Why? The purpose of flowers is to attract pollinators who will spread the plant’s genes— promoting the continuation of the species, said Fant. When a plant is red, it attracts birds as pollinators, but if it is yellow, it attracts bees. White flowers are particularly appealing to moths—especially those that bloom after sunset when moths are out and about. The color, combined with the scent, allows a plant to lure in a specific pollinator. This information led to a hunch when Fant considered the white flowers on the downy Indian paintbrush in Colorado and at Illinois State Beach Park, where he conducts much of his fieldwork. Most species of Castilleja plants produce red flowers and are known to be pollinated by birds. But here in Illinois, in the furthest east population of such plants, they chose a different color, and as he confirmed, a different pollinator. It is the question of why, and what that choice means for the plant, that Fant is now preparing to study when he returns to his field research this spring. Charismatic red flowers bloom on the gravel hill in the Dixon Prairie, Fant’s favorite area at the Garden. Ultimately, Fant tracks how genes move within plant populations, which largely hinges on how they are carried by pollinators. He examines plant DNA to determine if they share one or more genes, and are therefore related. Then, he maps the location of related plants, tracking the movement of specific genes and inferring how and why they got there. “There’s always some reason for the movement,” he said. 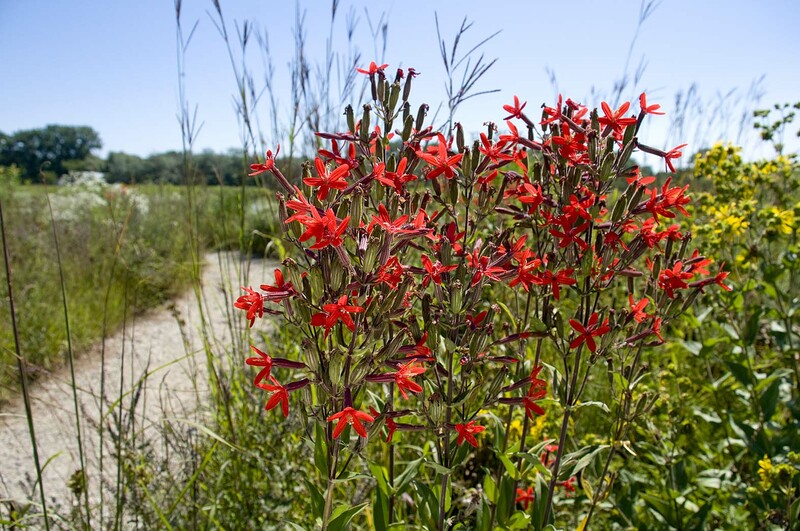 This spring and summer, look for red flowers on the gravel hill in the Dixon Prairie, where Dr. Fant is growing unique bird-pollinated plants such as the royal catchfly, with the goal of increasing the plants’ genetic diversity. Fant noted that moths are often overlooked as pollinators, and along with Dr. Skogen he is especially interested in studying their relationship with many kinds of plants. 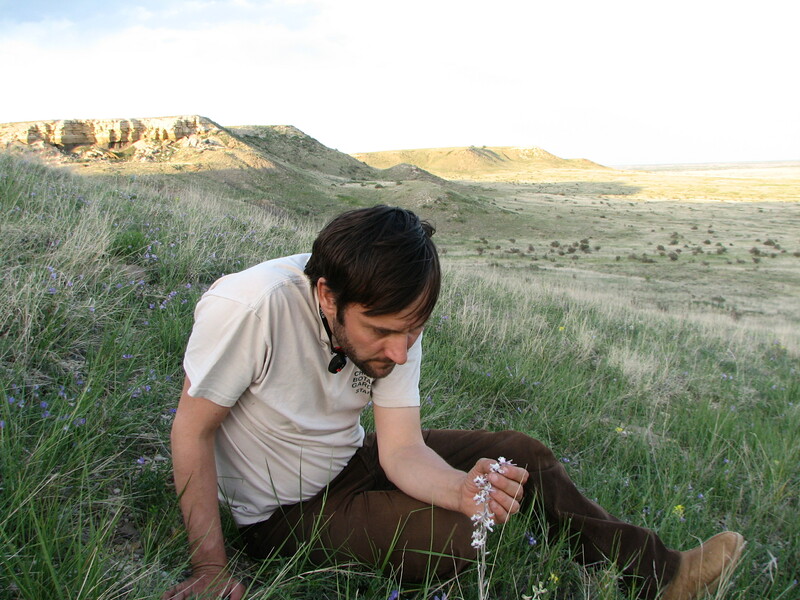 In addition to the Castilleja, he also studies rare species of the gravel hill in the Garden’s Dixon Prairie. At the end of our conversation, Fant, dressed in a bright-yellow sweater, jumped up from his desk and headed toward his lab in the Daniel F. and Ada L. Rice Plant Conservation Science Center, where he is always moving forward to catch up with the past.